minuet of life: Prada: What is Saffiano Leather? I recently took a new obsession on this particular bag, Prada saffiano lux tote. Three words: Classic, timeless, elegant. Different zipper details on the bottom one. I personally prefer the zipper, since it looks much more elegant and structured, compared to the normal tote (I love structure). The golden hardware isn't too heavy nor too flimsy, it hits just the perfect combination. They come in many different shades, though, and coming to a decision on which colour to get is quite baffling. If you're the hands-free type of shopper, consider the strap alternative. See the collections here. Saffiano leather has been known as a Prada signature and its most historic leather. I've only heard of it when I started paying attention to the bags above, they're really pretty I can't help but wanting to look at them more and more! I asked my friends about the leather and none know of it. As usual, our nice uncle Google has the answer to all. Here is the information I've gathered so far from various sites and notably, The Purse Forum! Thanks so much for all the helpful threads from our knowledgable seniors! Saffiano is a textured leather, meaning that it is a treated leather made with the texture pressed on it by a machine. 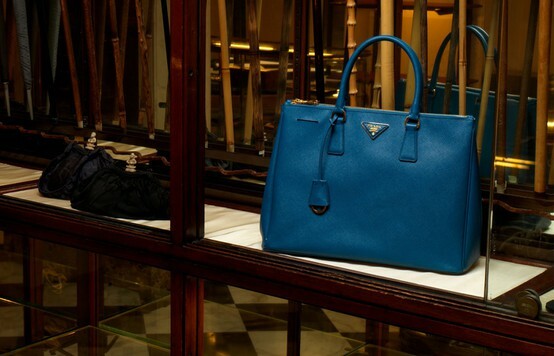 It gives the leather a cross-hatch finish, which is a special diagonal pattern that is patented by Prada. This calf hide leather is also finished with a wax treatment. As a result, the leather is pretty much scratch resistant and durable (just don't try it with your razor). Images from misspouty and other sources.